No matter what the occasion, BRIO's private and large dining rooms provide the perfect backdrop for all of your special events. Our packages offer a variety of high quality, made-to-order Italian specialties sure to please! Our staff will provide a memorable experience for you and your guests! BRIO (meaning "lively" or "full of life") is a "polished casual" restaurant serving authentic, northern Italian cuisine. The subtitle, "Tuscan Grille" is descriptive for a menu that features oven-roasted steaks, chops, and seafood; similar to what one would find in an authentic ristorante in Tuscany. BRIO's philosophy of "to eat well, is to live well" is why they only use the finest and freshest ingredients. BRIO brings the pleasure of a Tuscan country villa to the American city. To learn more, go to www.BrioItalian.com. Grilled Chicken Marsala "Under the Brick"
The food and service was good. I have eaten at this restaurant several times. The food is generally good but the lobster bisque is much too salty, I will never order it again, bad for my blood pressure. The shrimps were slightly overcooked and dry. I enjoyed the food. I had the Rack of Lamb. My friends has the lemon and rosemary roasted chicken and the shrimp and lobster fettuccine. I have been to several Brios and was always happy with the food and service. This is the exception where I was disappointed with the service on this occasion. The place appeared to short staffed where our waitress was both the bartender and service. It took over 10 minutes for her to take our order and drinks didn’t arrive for 30 minutes after the maitre’d started to help with the service. First of all, they told Open Table that I did not attend. I DID go there just as scheduled with my granddaughter for her birthday. Last year they gave her a nice little dessert after lunch, but they said they no longer do that. She had an adult portion meal which was huge. Everything was very tasty. The food quality was excellent but the portions were a bit skimpy for the price. Specifically the salmon dish though It was very fresh. The service was very good and food came out on time. I wouldn’t recommend the Chianti Ruffino at 11.00 a glass probably the reserve would have been good but too pricy. Great setting and we were lucky that it was not a busy night so we had a great time enjoying dinner and talking. My visit here was very poor. The first and LAST time I visit brio !! From the time we arrived until the end . I had reservations, and still had to wait even though, the place was nearly empty. The hostess were nice , the waitstaff was so so . The food and drinks all came out inaccurate. Our waitress may have been a new hire ....visible nervous.... not familiar with the menu. Food was subpar, would have been better off going to a food court in the mall . I noted in the reservation it was for a celebration, No one ever asked what the occasion was or if they could offer anything to help celebrate. Then to make things worse Two members of my party became sick, after tasting their food....while we were still in the restaurant !! It was a disaster, I was so disappointed and unhappy. Food was not amazing--I got the pesto pasta (the one without chicken) and was underwhelmed. Also got the chocolate lava cake which was fine but nothing special. I came on a weeknight for an early dinner so it wasn't busy which was nice, but I would imagine it could get quite loud/noisy. Decor was fine but overall overpriced for mediocre food. BRIO is the only restaurant in Tysons where you can actually talk to the other people at your table. It is seldom crowded at lunchtime so it is easy to get a table. The lunch specials are a good value. I did not like the Shrimp entry I ordered; however, the shrimp were very tasty and cooked perfectly. The wedge salad was great! Brio is a great place to dine with friends! It's quiet enough to talk--at lunch, anyway--and the food is delicious, starting with the bread basket, which features excellent sourdough and flatbread with herbs. The pasta arrived piping hot, and Parmesan grated fresh at the table was offered. I often hesitate to order spaghetti carbonara, since it can quickly devolve into a creamy mess, but the strands of spaghetti were coated perfectly and stayed apart. There was plenty of pancetta in the dish, and crispy bacon was sprinkled on top--a nice touch. Service was attentive but not cloying, and we weren't rushed at all. We'll be back soon! This was a very enjoyable time I had eating at this wonderful restaurant. Food was excellent and service was spectacular. I will be coming again. Outstanding food and service as usual which is why we come back!!! The food was very mediocre, and what was a bit of a let down. The wait staff tried to please, but they got confused pretty easily, and I had to remind them to bring my wine, my kid's drink, and eventually my change. This is one of our favorite restaurants even though we have to cross state lines to get there. In addition to great food & service I love the finish on the walls! Party of 5, restaurant wasn’t crowded but meals took over 20 min to arrive at our table. No manager came over to explain the delay or check with us. Brunch was delicious especially the stuffed french toast. Food was well prepared and served efficiently. The amount of food was a good ratio to the price point. It wasn't so much that we couldn't eat it all but it did fill us sufficiently. Our waiter was very nice and served and removed plates without interrupting the conversation at the table. The restaurant was comfortably full for 6:00 on a Friday evening but not so loud we couldn't hear each other at our table. Good food and plenty of it. Mighty fine. We plan to go again. The service was quick. If your waiter/waitress is not available right away, someone is always present to help out. The food was delicious, the ambiance was great, and the service overall was superb. I would recommend this place to anyone who is looking for a place to eat. Looking forward to the next time that I bring my wife there again. Keep up the great work! My wife and I went to Brio for Valentine's Day. I started with the Brio Old Fashioned cocktail, which was one of the best Old Fashioneds I've had, much better than the ones I make at home. We then shared the tomato caprese appetizer, and both the tomato, mozzarella, herbs and olive oil were delicious. My wife had the salmon entree, and she was not that thrilled with it, unfortunately. I had the chicken limone and thought is was wonderful. I've always loved the bread basket at Brio, with its tasty flatbreads and flavorful, warm bread with butter. We each had a tasty dessert -- the molten chocolate cake for my wife, and the crema catalana for me. Both were delicious! Being Valentine's Day, the place was quite full, but we had a reservation and were seated as soon as we arrived, even though we were a few minutes early. Despite the crowd, the noise level was quite good and we had no trouble conversing in a normal voice, even though we are no longer "spring chickens." We'll definitely go back, as we have done many times over the years. I always forget how good the food is here when I visit. They have a great lunch special with soup or salad + small portion of somethings. I love that! the freshly made pasta is sooo good. The steak salad is very large and delicious and the bread is great too. I will go back again soon. I made a reservation through Open Table for the Patio area near the mall. When I arrived we were seated there but the waiter forgot about us. It the manager know and then we had steady service. The food was hot and fresh. Server poured white wine into glasse whthiut any teat or comment like to pour water to glasses, i have not been experienced this kind of sercing for wine ever in my life. All sever need to be trained at least,,basic education before they stand on the table serving. Food was excellent. Served nice and hot. Drinks were expensive, given that it was Happy hour. Have been there many times and each time we've been pleased. Only one waitress who was also the bar tender!!! She was pleasant and did her best but there should have been more staff. I would not recommend this restaurant. Every dish was dry with child portions. The service was mediocre at best. No wonder we could get a reservation since Maggianos was booked. NEVER AGAIN!! Disappointed with both the service and the food. Normally our reservations are smooth and I was looking forward to dining at Brio for my birthday. After a less than professional telephone call from the restaurant to confirm our reservation and strongly remind us to be on time or our table will be given away, we waited nearly 10 minutes upon our arrival at the restaurant for someone to even acknowledge us. Once seated, we were quickly greeted and our drink order was taken immediately but then it took nearly 30 minutes to get our drinks (water, soda, tea). Our food took nearly an hour to be served and was unfortunately not hot and below the average for taste. We had to ask multiple times to have our drinks refilled. Dessert was pricey for the portion. Brio used to be one of my favorites but it will be a while before we head back. On a Saturday night, the noise level was intolerable. Seated between two large birthday party celebration tables. Took forever to receive our cocktails, then one arrived in a visibly chipped glass. Chicken soup was tepid. Salmon entree salad was devoid of advertised arugula and sliver of salmon was dry. Kids' pepperoni pizza came first without pepperoni and had to be returned. "Shrimp Capri" came with angel hair pasta that was totally overcooked and watery. Fish of the day special - striped bass - was good and plentiful, but at $28.75, cost more than twice the average entree. Everything else was mediocre, at best. Service was well-intentioned but slow. Won't be returning anytime soon. Salmon was asked to be cooked well done and came raw on the inside. I sent it back and it was microwaved and so tough I could not eat it. Awful meal and server was a waste. Did not make a fuss as I was a guest. Too many good places to go at Tyson’s. Won’t be back. First visit to this place. Quiet, reasonably comfortable, good service. We enjoyed the tasty crab cake appetizer and the Italian Wedding soup. My companion was served the soup although she had asked for a salad, but enjoyed the soup anyway. The booth seats were a bit low but OK. Altogether, a nice dinner, especially for a mall restaurant. Overall, we had an outstanding experience. The food was excellent and our service exemplary. I ordered an egg white omelet but was served a regular omelet. My waiter found out the kitchen ran out of egg whites. My meal was removed from the bill and the manager came over to apologize. I visited Brio on Saturday and was surprisingly disappointing. 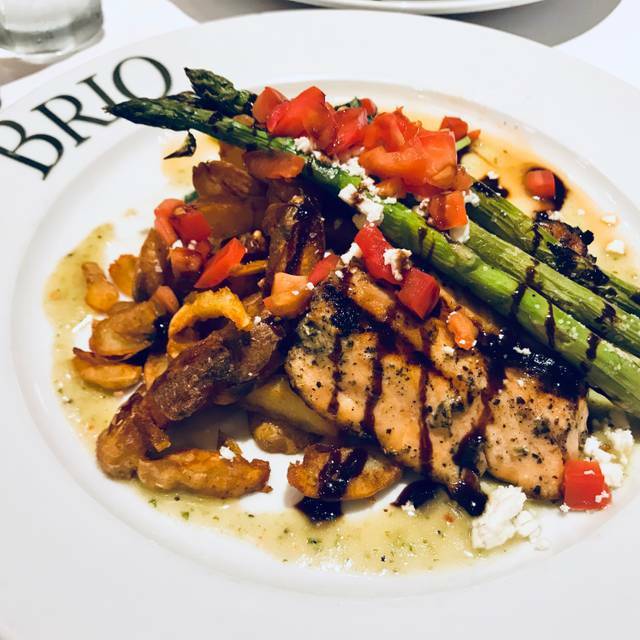 I've been going to Brio for many years and they maintained a very good menu and service. During my visit, I was presented with a much-reduced size menu where many excellent items were taken out from their main dishes, appetizers, and salads. The portions are smaller and the price is the same or higher. I noticed some items (steak) that are priced at $45 for a 6oz. Why would anyone pay that much at a place that is not a steakhouse or a specialty. I ordered their Spaghetti Cacio E Pepe and it tasted very blah, i requested a Pomodoro sauce to add something to the flavor, but the waiter brought me just a marinara sauce which is whatever. He didn't seem to care much on checking on us and when he goes to get a refill or my sauce, he takes forever. I won't go back until they bring back their famous items and go back to their regular portion size. Menu changed and dropped our favorite dish. Don't like new menu. Carser salad with a side of salmon, paid more for the salad than the salmon?